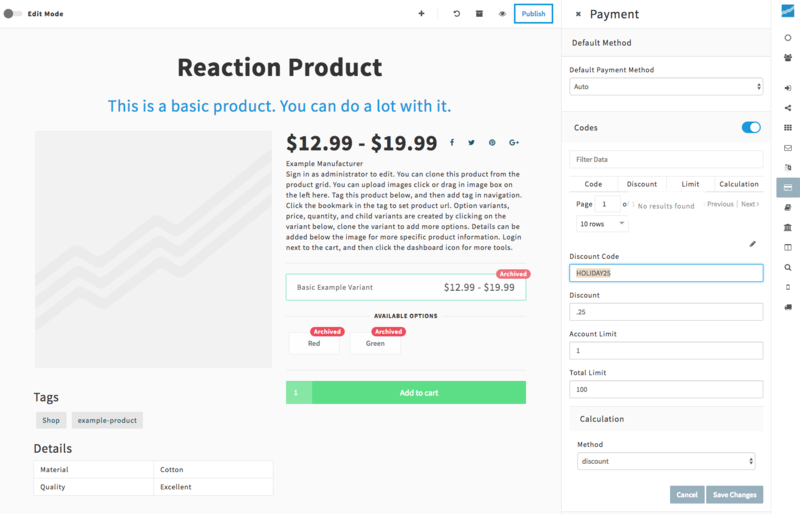 Reaction has support for discount codes and discount rates. A "code" is a code that can be applied during checkout that applies a discount to the cart subtotal. A "rate" is a discount that is applied without needing a discount code to be applied. Discount codes can be enabled in the Payments settings in the Reaction dashboard. shipping - the formula value should be a string that matches the name of a shipping method. The calculated shipping rate will be applied as a discount. Discounts are validated when a user enters a code during checkout, and are applied as payment methods on the cart. The discount code usage is tracked once the order has been placed.